As we near the one-year anniversary of the trade that saw the Edmonton Oilers send netminder Ben Scrivens to the Montreal Canadiens in exchange for forward Zack Kassian, one can’t help but to take a moment and reflect. While the former is currently playing goal for Minsk Dynamo in the KHL, the latter has managed to not only find himself a regular a spot in Todd McLellan’s starting lineup but also become a fan favourite in a city that once viewed him as Public Enemy No. 1. RT if you want Kassian's 44 retired at Rogers Place. That’s right folks, over the course of 69 appearances in Oilers silks, Kassian has turned himself into the kind of player large chunks of this fan base have been starving for. After years of watching their beloved side be pushed around on a nightly basis with next to no response, the want for players willing to stand up for both themselves and their teammates had reached an almost fevered pitch. While that thirst has been quenched from time to time this season, the 25-year old took it another level last night in Arizona. As satisfying as beating the Coyotes in regulation for the first time since 2011 felt for much of Oilers Nation, watching No. 44 react in the manner he did, in coming to the defence of a fallen teammate, was what seemed to resonate most with the masses. On an evening in which the trio of Matt Hendricks, Kassian and Mark Letestu carried load up front, scoring twice and combining for seven points between them in Edmonton’s 3-2 victory, it was the response to a hit from defenceman Oliver Ekman-Larsson that grabbed everyone’s attention. 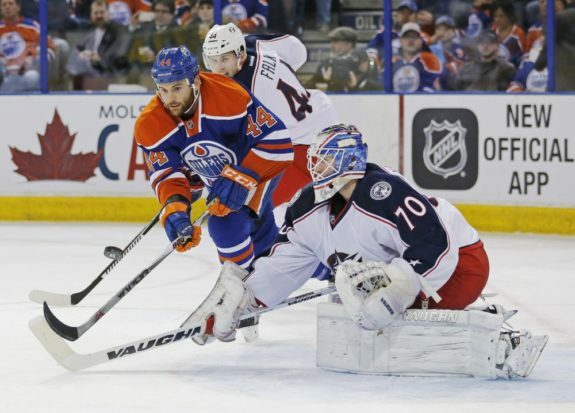 Kassian' game tonight embodies everything Oilers needed to change, and have. Size that can play, and be physical. In what turned out be a rather chippy affair, that featured some questionable decisions from players on both teams, it was the aforementioned Ekman-Larsson hit on Hendricks in the third period that triggered an outburst. After watching his linemate crash into the end boards, Kassian wasted little time in flattening the Coyotes star blueliner with a vicious cross check to the back, followed by a cheap shot to the chin of Anthony DuClair, before being wrestled to the ice by Shane Doan. While that may sound like an overreaction to what was a clean hit, it was one that did not need to be delivered but a response was essential. Two minutes for interference on Gryba would have made sense. That's about it. Earlier in the period Oilers defenceman Eric Gryba was, in my mind, unjustly assessed a game misconduct for a hit on rookie Jakob Chychrun. While different from the Ekman-Larsson hit, it was every bit as unnecessary. Not surprisingly, the Coyotes responded in the manner one would expect, especially considering the youngster had already been crushed into the side boards during the first period by Hendricks, in a collision that could not be avoided. So, with the shoe now on the other foot, it seemed only natural for Edmonton to do their part and Kassian appeared to be more than happy to engage and Oiler fans loved it. Once you combine what some consider a questionable hit, with yet another chapter in the almost nightly mugging of Connor McDavid and you suddenly have a fan base that has reached a boiling point when it comes to the referees. Standing pat simply wasn’t an option and the reaction via social media only further confirmed that mindset. It cannot be stressed enough, the masses are tired of watching this group get pushed around and last night lined up perfectly for a chance at a little push back. The points were essentially in the bag and the opportunity presented itself late in the game and with the right players out on the ice. To his credit, despite having been a little snake bit on the offensive side of the equation, Kassian has been a fairly useful bottom six forward for the Edmonton Oilers through the first-half of their 2016-17 schedule. As odd as it may seem, the vast majority of fans couldn’t be happier to have him around. Let’s not forget, this is the same player who just over three years ago shattered the jaw of Sam Gagner with a vicious slash to the face during a preseason game in 2011 against the Vancouver Canucks. Apparently, time and switching sides can heal all wounds. Kassian's third goal waived off of the year. Playing well, but can't catch a break. Hard to imagine isn’t it, and yet here we are. Add to that the successful transformation in his day-to-day life away from the rink and Zack Kassian starts to look more and more like a useful NHL player. While he will never live up to his draft class status as a Top 15 selection in 2009, the Edmonton Oilers and their fans are glad to have him and almost no one could have seen that coming when they acquired him on December 28, 2015.